Esaf’s large warehouse also includes thermal resistant thermocouples, in other words temperature probes that are highly reliable measurement systems, very sensitive to heat variations. The company, based in Milan, is the ideal partner to turn to for the purchase of electric components for the thermal regulation sector: in fact, it only selects products from trusted brands to deliver excellent performance for all uses. Heating bands, cables and thermal resistors are among the leading products widely available in the product catalogue and Esaf warehouse. 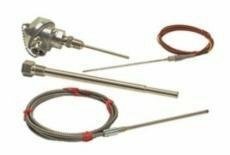 The thermal resistant thermocouples available in the warehouse are made of two different types of metallic conductors connected to a joint and encapsulated in a metal tube. With temperature variation even the voltage varies and can be read at the top of the conductors, thus providing the measurement of the temperature where the joint is located. You will find conventional systems and in oxidised minerals with insulated joint models and purchase them by contacting ESAF. In ESAF’s catalogue you will also find thermal resistors which, unlike thermocouples, use a sensitive element that is put at the far end of the piece and whose electrical resistance varies with the variation of temperature, supplying a measurement. For both we supply the PT100 models, also with mineral isolation. You can consult the online product catalogue and contact the Milan office to request an estimate or to place an order. PT100 thermocouples and thermal resistors, also with mineral insulation.